Yanni Gourde scored in overtime for the Tampa Bay Lightning as they pulled out a 4-3 comeback victory over the Ottawa Senators on Sunday night at the Canadian Tire Centre. 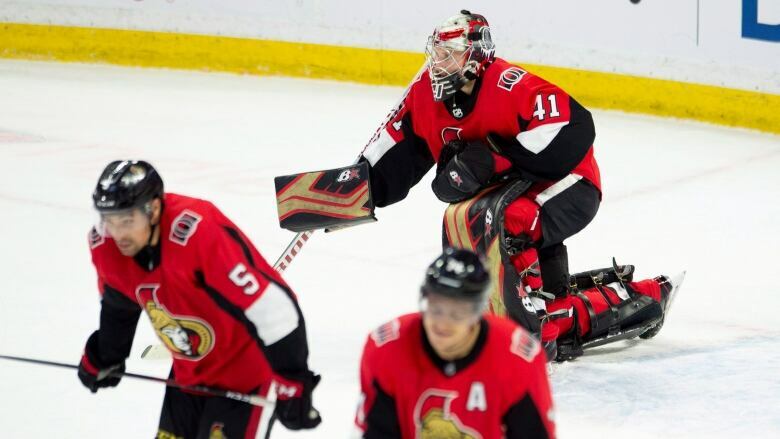 The Ottawa Senators held a closed-door, players-only meeting after dropping a 4-3 overtime loss to the Tampa Bay Lightning at Canadian Tire Centre on Sunday night. The Senators (5-6-3) have now lost six of their last seven games and the players know they need to right the ship. "As a group, collectively, we've got to take some ownership for our play and our results," said Senators defenceman Mark Borowiecki. "It's been a few too many years here for us where the players haven't taken ownership. Tampa (10-3-1) leads the Eastern Conference standings and while Ottawa managed to hold its own as it led 2-1 after two periods, another third-frame breakdown allowed the Lightning to get back into the game. The Senators have now been outscored 21-12 in the third period this season. "We've been a bit of a punching bag at times in the third period where we're not able to break a team's momentum and create some of our own, so that's something as a group we need to address and we did," said Matt Duchene. "It's unfortunate because we did do some really good things. We had a big game from [Craig Anderson], but the thing we're having trouble with is putting it together for 60 [minutes]." Yanni Gourde scored the winner 14 seconds into extra time after Brayden Point was able prolong the game, scoring on the power play with 27 seconds remaining in regulation. Cedric Paquette and Mathieu Joseph also had goals for Tampa. "I really thought our guys chipped away and it did not come easy," said Lightning coach Jon Cooper. "They had to continue to work, obviously all the way to the very end, but the group has showed that this year with us and I thought they deserved the two points." Tampa made the most of a two-man advantage after pulling goalie Louis Domingue, who stopped 22 shots, and Ottawa's Mikkel Boedker was assessed a slashing penalty, which the Senators felt was a weak call. Bobby Ryan, Maxime Lajoie and Cody Ceci scored for the Senators, who were coming off an embarrassing 9-2 loss to the Buffalo Sabres on Saturday afternoon. Anderson bounced back to make 41 saves after giving up three goals on ten shots and getting pulled against Buffalo. Ottawa led 2-1 going into the third, but Tampa tied the game at 3:04 in the period as Joseph scored his first career goal. Anderson kept the Senators in the game as the Lightning outshot Ottawa 10-1 through the first ten minutes of the final frame. Ottawa regained the lead late in the third on a delayed penalty call as Chris Tierney found Ceci all alone in front. But Point was able to tie the game with 26 seconds remaining in regulation with a two-man advantage. Borowiecki missed a chance to clear the puck and Tyler Johnson spotted Point at the side of the net. "It went from game over to three of their guys going the other way and somehow [Ryan McDonagh] kept it in after taking a shot off the back of his foot or leg or whatever it hit," said Tampa captain Steven Stamkos. "It was a pretty amazing play and it goes to [Johnson] and he makes a great play to [Point]. Game-saver right there for us." Trailing 2-0, the Lightning got on the board early in the second as Paquette scored 38 seconds into the period, jumping on a rebound in the crease. Ottawa leaped out to a 2-0 lead on power-play goals by Ryan and Lajoie, who tied Ryan Dzingel for the team lead with five goals. Borowiecki was making his to the Senators' lineup after serving a three-game suspension for a hit to the head on Vegas Golden Knights forward Cody Eakin. This is the first of four meetings between the two teams.